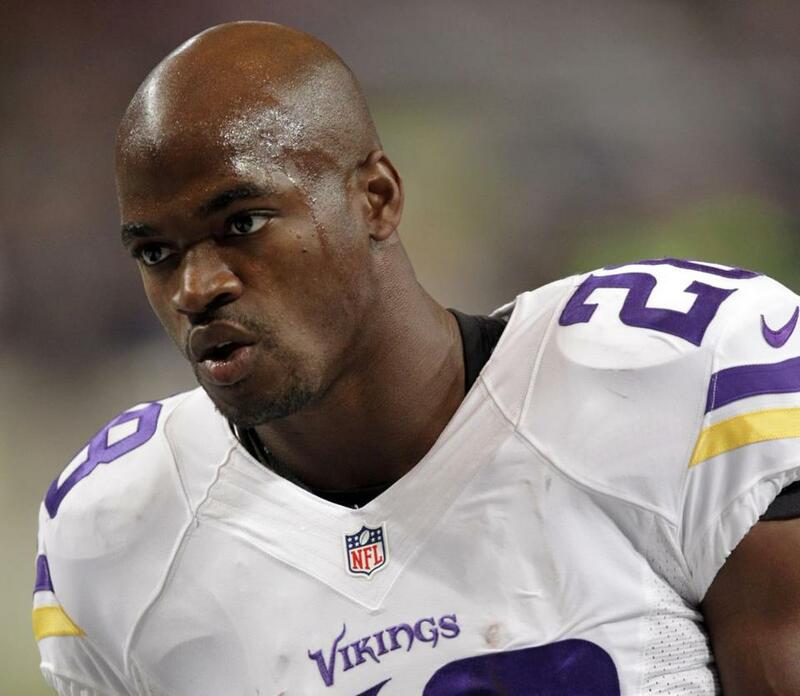 Vikings running back Adrian Peterson was deactivated for Sunday’s game against the Patriots. Another prominent player in the National Football League was charged with a violent crime Friday, capping an embarrassing week for the league that has faced unrelenting criticism of its handling of domestic violence cases. Adrian Peterson, a standout running back for the Minnesota Vikings, was indicted Friday by a grand jury in Montgomery County, Texas, on charges of reckless or negligent injury to a child, and a warrant was issued for his arrest. An unnamed official at the Montgomery County, Texas, jail told the Globe early Saturday that Peterson had been booked and released on $15,000 bond. Peterson, one of the best running backs in the NFL, was deactivated by the Vikings for Sunday’s game against the Patriots in Minneapolis. He has been at the top of the Patriots’ scouting reports all week. According to radio station KILT in Houston, which obtained the police report, Peterson acknowledged that he “whooped” his 4-year-old son while the child was visiting him in May. The station reported that when the child returned to Minnesota, his mother took him to a doctor, with the boy saying that Peterson had hit him with a tree branch. 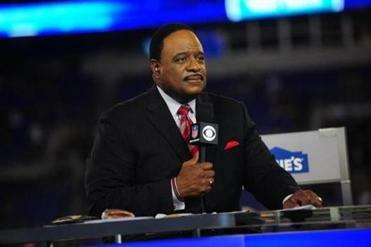 The broadcaster rose to the occasion during CBS’s inaugural “Thursday Night Football” broadcast. The Peterson indictment comes at a sensitive, controversial time for the NFL. 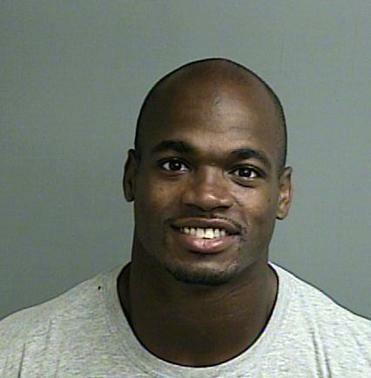 The booking photo of Adrian Peterson from the Montgomery County sheriff’s office. The week began with running back Ray Rice being suspended indefinitely by the league — and released by the Baltimore Ravens — on Monday after a videotape showed him knocking his then-fiancée unconscious in an elevator at an Atlantic City casino. The New York Times this week reported that there have been 85 arrests or citations involving NFL players and domestic violence since 2000. Still another development emerged Friday affecting the reputation of the image-conscious NFL, this one involving concussions and brain injuries suffered by its players. The Times reported that the league acknowledged in court papers that it expects nearly a third of retired players to develop long-term cognitive problems. The child injury case involving Peterson began unfolding Thursday, when he missed practice for what the Vikings was a “not injury-related” reason. He returned to practice Friday and was listed then as a full participant. “Adrian Peterson has been informed that he was indicted by a grand jury in Montgomery County, Texas for Injury to a Child. The charged conduct involves using a switch to spank his son. This indictment follows Adrian’s full cooperation with authorities who have been looking into this matter. Peterson has the most rushing touchdowns (86), most total touchdowns (91), and most yards from scrimmage (11,905) in the NFL since 2007. He holds the NFL record for single-game rushing yardage (296), and came within 9 yards of Eric Dickerson’s single-season mark in 2012, when he ran for a career-best 2,097. Meanwhile, the ramifications of the Rice case have continued. After mounting criticism this week, the NFL named former FBI director Robert Mueller to head up an inquiry of its handling of the accusation againstRice. Rice was suspended and released this week only after a videotape surfaced of him striking his then-fiancée; prior to that, Rice was given only a two-game suspension by NFL commissioner Roger Goodell, a punishment that was roundly criticized as being too light. Rice would have been eligible to play for the Ravens now had it not been for the newly released videotape. Greg Hardy, a defensive end for the Carolina Panthers, was convicted in July of assaulting and threatening a former girlfriend, yet is still playing while the verdict is being appealed. Ray McDonald, a defensive tackle for the San Francisco 49ers, was arrested on Aug. 31 after an incident involving domestic abuse. He, too, remains in uniform. After the negative reaction to Rice’s initial two-game suspension, Goodell admitted he made a mistake, and announced a new league policy regarding domestic violence.